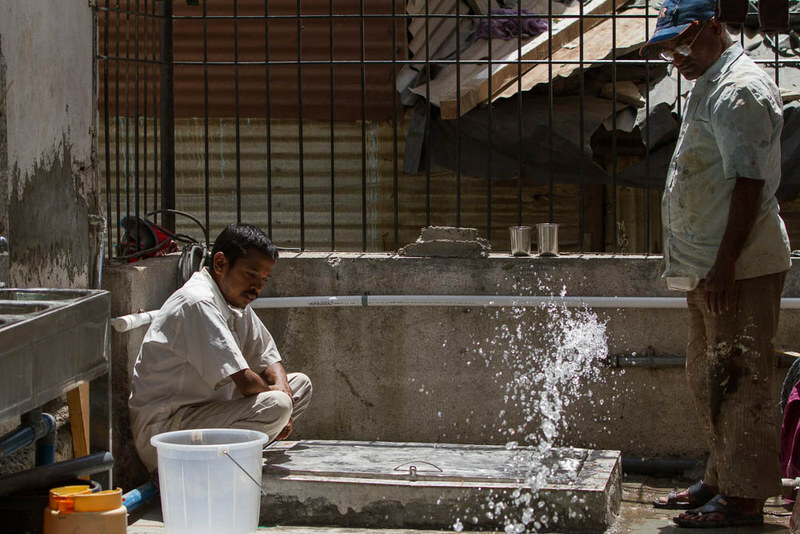 Although we had relied on a water filter to provide clean drinking water, this machine was a small home filter, with one tiny spout and a slow flow, designed to provide drinking water for a single household, not hundreds of people on a daily basis! Needless to say, keeping the drinking water vessel filled during mealtimes was a tedious task, and crowding in our Centre’s small kitchen area often occurred during peak hours, plus the machine required frequent maintenance as a result of constant use beyond its originally intended capacity. This is why when the idea for higher-capacity, industrial-quality water filtration stations was originally mentioned to us in March, we jumped at the opportunity! 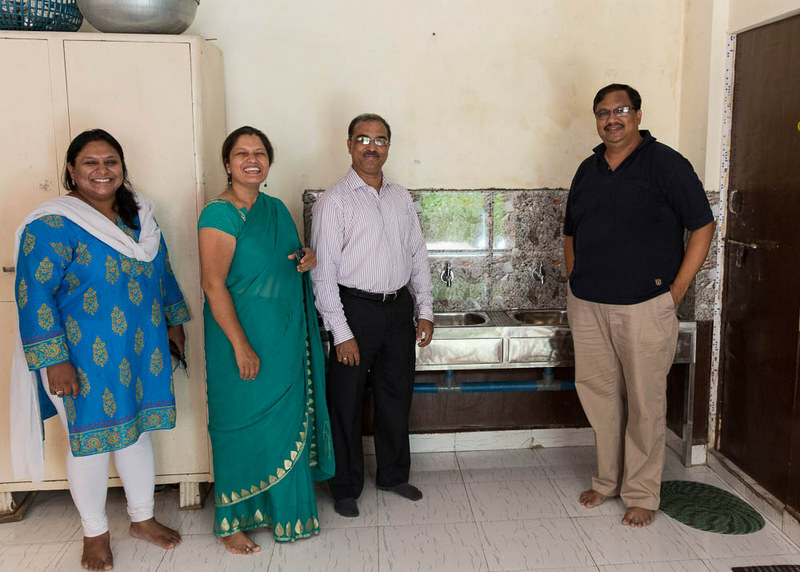 The project, dubbed “Jal Ashraya” (water shelter) was the brainchild of Rajesh Chhatre, who wanted to do something for children in the local community as a part of Lloyd’s Register’s ongoing Water Matters corporate social responsibility campaign. 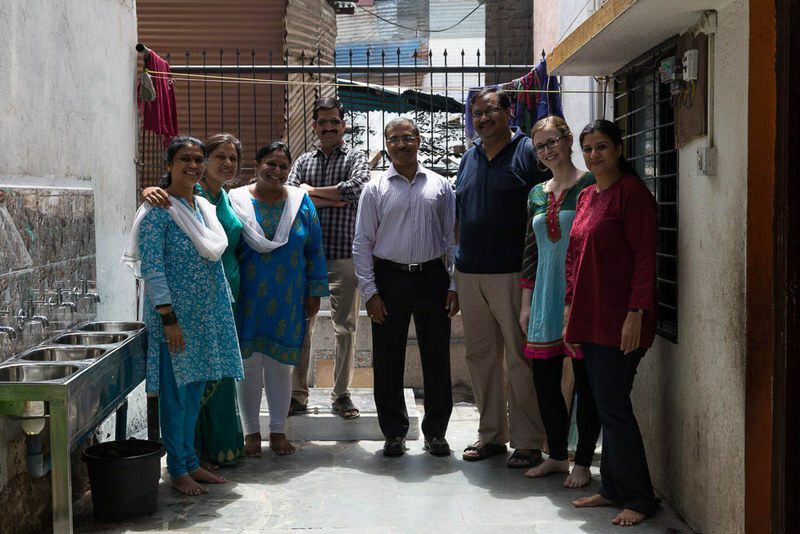 Rajesh knew of AIC through Health and Community Program Director, Madhavi, and when he visited in April, he saw scope for implementation of a water project that would impact hundreds of children. He decided to spearhead the initiative, even going so far as to request accelerated sanctioning and implementation from the Lloyd’s Register international team so that the construction work could be completed during the summer holidays, to minimize inconvenience to AIC children and staff. Construction happened during May, and wrapped up just in time for the Education Centre to re-open in June. 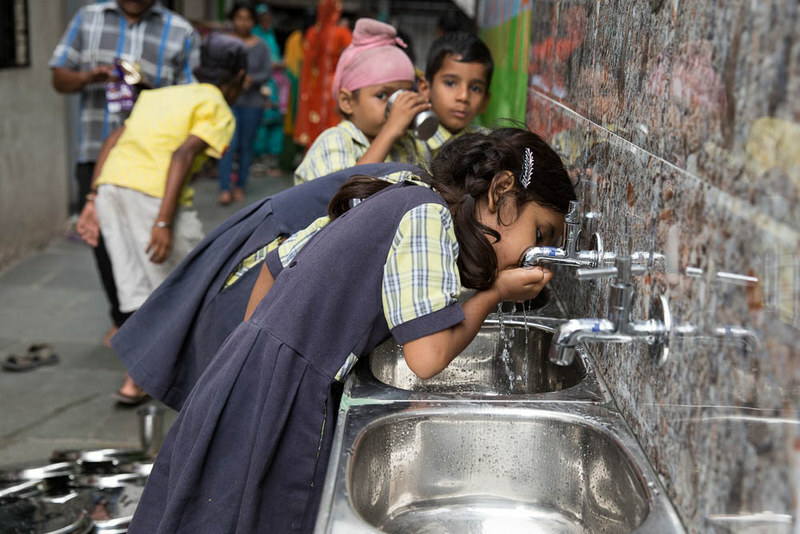 Upon returning after summer holidays, the children were greeted by 8 shiny new taps and plentiful clean drinking water! The taps are contained within two water stations, one outside of the kitchen and one inside in the dining area. Each station has 4 tap outlets for drinking water, with stainless steel basins mounted on a stainless steel platform and tiled with a ceramic backsplash. A 500-liter storage tank funnels water through a heavy duty membrane filter and special grade plastic pipes, ending in a closed drainage system for each station. During the construction process, the Lloyd’s Register folks even cleaned and repaired the main water storage tank underground as well. As the name of the Lloyd’s Register campaign suggests, water matters. And when your family lives in a tiny hut in the slum that doesn’t have running water, forcing you to rely on communal government taps that only receive water for a few hours per day, it matters even more. 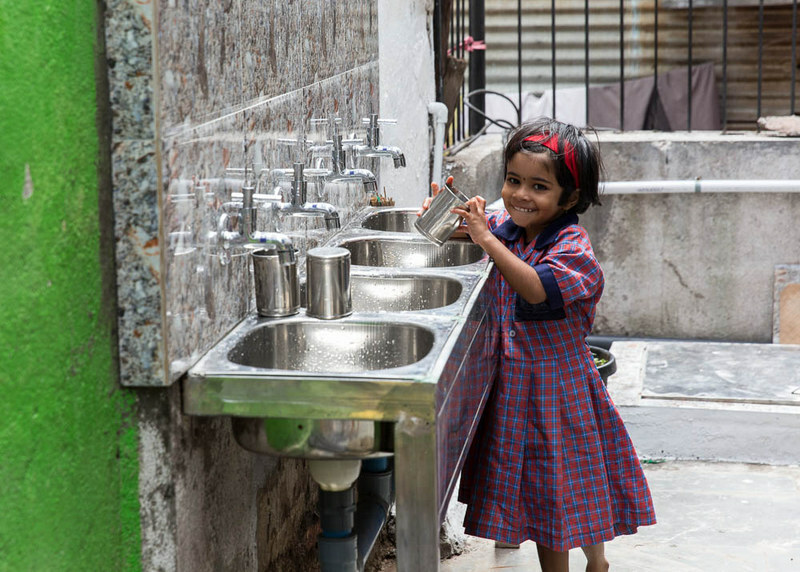 The children are thrilled with the new taps at our Education Centre, which functions to many as a second home. Not surprisingly, the caregivers and kitchen manager are equally relieved, as they no longer have to do constant crowd control around the solitary drinking tap. 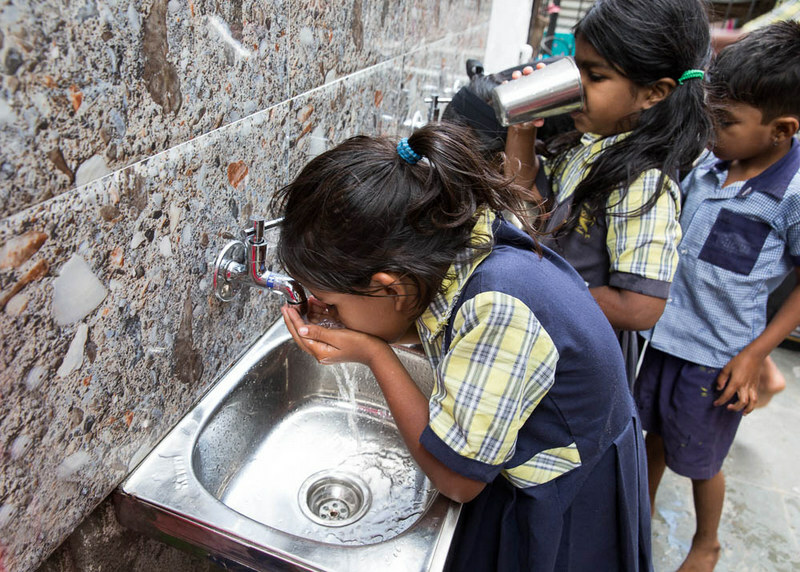 Having abundant water storage and ample locations for children to get a drink and wash their hands is already making such an incredible difference here at AIC. Again and again, we have been blown away by the kindness of those in the local community (and beyond!) who are eager to support our work in wonderfully diverse ways. We are deeply grateful to the entire Lloyd’s Register community (with a special mention to Rajesh and his team for the passion and speed with which this project was implemented!) for their commitment to our children.